The Ultimate Bowhunter's Tool. Designed with the serious compound and crossbow enthusiast in mind. The BowSharp features five essential tools for archers, all combined in one easy to use and portable package. 6" overall. The Tungsten Carbide sharpening element plays double duty and is specifically designed to be able to sharpen knives as well as broadheads. Extending the sharpening element to the outside of the handle gives bow hunters the ability to sharpen broadheads safely, with greater accuracy and superior results. Integrated broadhead wrench allows quick work of changing and maintaining broadheads. 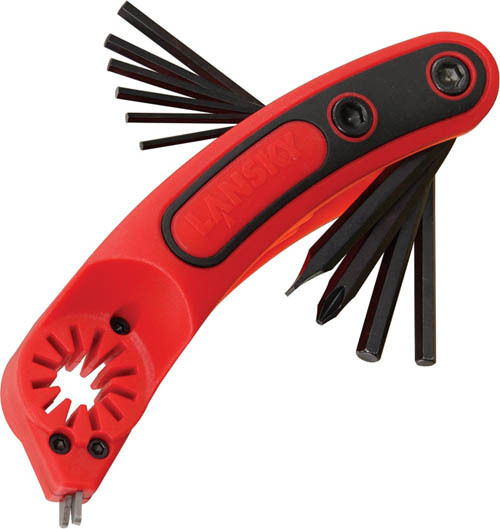 Collapsible tool kit is integrated into the handle and features a full set of eight Allen Wrenches ranging from 5/64 to 7/32 as well as both a flat head and Philips screwdriver. These tools make quick and easy work of any adjustment to a bow at camp or in the field. Red composition body with black trim features a rubber grip for safety and is easy to use in wet or dry conditions.